Scientists from UPV/EHU-University of the Basque Country’s have proven that the oligochitosan polymer has the potential to directly supply DNA to tumor cells to act on them. 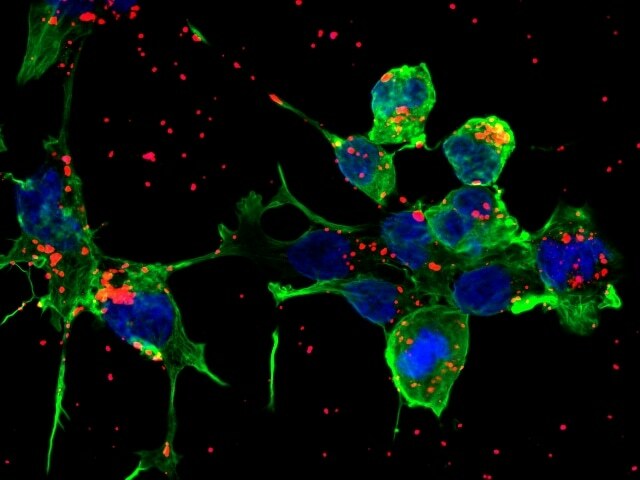 Image showing the nanoparticles entering human primary neuronal cells. The blue areas are the cell nuclei, the green ones are the cell cytoskeleton, and the red areas, the nanoparticles (Mireia Agirre / UPV/EHU). Scientists at UPV/EHU’s Department of Pharmacy and Food Sciences have suggested the use of oligochitosans, which are taken from crustaceans, in gene therapy. Mireia Agirre is one of the scientist in the team, and she has shown that by using oligochitosan both small and large DNA molecules can be directly supplied to the cells. This will help in the synthesis of the biological components that act on the tumor cells. The technique can also be used to treat diseases in the central nervous system. The therapeutic method of gene therapy involves treating disorders triggered by defective genes, by introducing genetic materials into the cells. By doing this the biological components essential for the therapy can be synthesized, the genetic defect can also be cured or the ill effects of the defective gene can be stopped. A carrier that can shield the gene from degradation of enzyme is essential for the proper delivery of the gene to the cell and the subsequent biological component synthesis. This type of carrier will help in the entry into cell and the journey to the cell’s nucleus. A carrier that can effectively and selectively deliver the gene into the nucleus of a cell is necessary. Light-molecular-weight chitosan polymers, such as oligochitosans, have been suggested by scientists at the UPV/EHU's Department of Pharmacy and Food Sciences, for gene therapy. Chitosan are natural polymers that are taken from the external skeleton of crustaceans. Mireia Agirre has proved that oligochitosans have the potential to directly supply large nucleic acids (DNA) to the cells, in her doctorate thesis. They can act on the tumor cells and help to cure the disease in the central nervous system. In this research we have shown that oligochitosans, unlike other polymers, are capable of delivering large plasmids (circular DNA molecules) although there are still things to be improved in terms of efficiency. DNA and Oligochitosan come together to create nanoparticles using the interaction between negative and positive particles, called the electrostatic interaction. We have been able to show that the transfection process is more effective in acid mediums. It should be pointed out that the tumor environment in our body is more acidic than normal, so it has been shown that these particles can be extremely useful in combating tumor cells. The transfection process involves introducing particles into the cells that travel all of the way to the nucleus. The particles take effect once they reach the nucleus and the protein that fights the disease synthesizes due to the help of the DNA present in the particle. The scientists did not make use of therapeutic DNA during the research. [However] by means of tests using large, non-therapeutic DNA molecules, we have shown that if oligochitosans are used, the size of the DNA does not limit their possibility of going all the way to the nucleus and synthesising the corresponding protein. The scientists have also proved that the nanometric particles have the potential to cure human primary neuronal cells and as such can be used to treat various diseases in the central nervous system. As the researcher explained, "the next step in the research would be to test what has been discovered so far on animals, in specific applications and using therapeutic DNA. It would also be important to improve the particle so as to increase its efficiency".